School Superintendent Don Dunn's eyes twinkle as he watches squealing elementary school children scamper around their new gym during physical education class. The Tyler Morning Telegraph reports the structure, one of two completed in recent months, has a light, airy feel with gleaming striped wood floors and the faint aroma of fresh paint. There also is a spiffy new cafeteria with round tables and plenty of room to open a milk carton without elbowing a classmate. Across campus, efforts are underway to construct a shiny new school, a much larger version of the old one that was destroyed last spring. At least 26 people are injured and 10 more unaccounted for after a tornado strikes the small town of Van, damaging about 30 percent of the city Sunday night. "It's been a long year," he said. "We've worked really hard to get where we are today." This same time last year, a deadly EF3 tornado plowed through the Van Independent School District, wiping away entire portions of its elementary campus and damaging the administration building. The storm attacked the town with a vengeance on May 10, 2015, Mother's Day, killing two people and injuring dozens more. Hundreds of homes were damaged or destroyed, leaving areas affected by the storm essentially unrecognizable. The weather produced some of the darkest days of Dunn's 25-year tenure as an educator and some of the brightest as well. "I didn't attend a single funeral of one of our kids," he said. "When something like this happens, it put everything in perspective. We're a close community and everyone rallies around everyone else." Fortunately, time has a way of healing and changing perspectives, so it's possible to find good in bad situations, he said. "I think we are absolutely blessed by that tornado coming through here," Dunn said. "As a result of that storm, we are going to provide our kids with a building that will serve them many, many years." 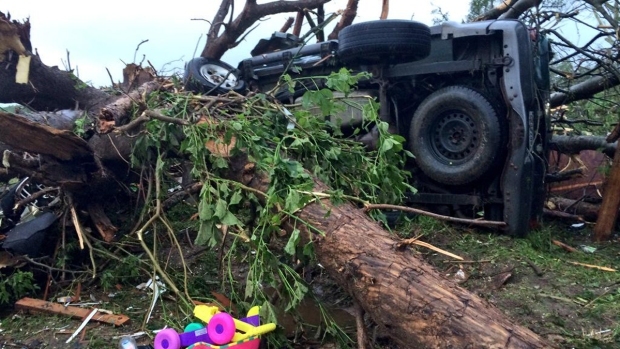 Shortly after deadly winds ripped through Van, Dunn picked up some of his coaches, and they followed the path of the tornado as it headed toward the administration building and lower grades. The shell-shocked men were sick with worry. With so many families caught in its path, did everyone survive? And did their school district suffer any damages? Pulling into the pitch-black parking lot, it was immediately evident there was no escaping the fury of Mother Nature. Debris was scattered everywhere . leaves, limbs, papers, whatever the wind happened to pick up. The educators, armed with flashlights, climbed out and ventured toward the administration building. They found wind and water damage. A front support was found almost buckled in half -- a casualty of a flying couch. "It looked a little like a war zone," Dunn said, his eyes taking on a weary look. "There was a sofa hanging on the hand rail; it came flying from across the street." A cast-iron bathtub was resting on the front walk, and a second one was sitting behind the building. In the bus area, there were more damages. The old gym, north cafeteria and J.E. Rhodes Elementary were essentially ripped away, leaving primarily remnants of days gone by and mounds of debris. The old high school, creaking and moaning as water poured inside, seemed to echo the reaction of the devastated educators. "There was debris everywhere," Dunn said. "It was almost unimaginable." They summoned a fence company, and in 24 hours the entire 37-acre campus was secured to keep everyone out but authorized personnel. "The first thing we had to figure out was, `What are we going to do with our kids?"' Dunn said. "We had two weeks of school left." The district closed for a week to regroup and then partially reopened with a new focus: to comfort, educate and create a plan for brighter days. Younger students were sent home for the remainder of the school year. A party was planned to let teachers and students reconnect emotionally. With the academic year coming to a close, school officials braced for an exhausting summer dominated by repairs and reinventing. "We wanted everything done by Aug. 1, so teachers would have time to prepare," Dunn said. "We had 77 straight days to get things done to make the deadline." It was a lofty goal, but everyone seemed to believe nothing was impossible. "I felt like we were ready for the challenge," said Danny Morrow, business manager for maintenance and operations. Area districts, such as Tyler, Brownsboro and Grand Saline, to name a few, pitched in with supplies and cut-rate portable buildings. Dozens of portables were grouped together to create "Vandal Village" for some lower elementary grades. Damaged class space that survived the brunt of the storm was repaired and spiffed up with fresh paint and carpeting. Administration employees moved into trailers to work until their building could be repaired and communications restored. It became a whirlwind summer as typical workdays stretched to 15 hours or longer, but efforts to pick up the pieces continued. Ready or not, school would start again in August. When the buzzer finally sounded to begin a new academic year, district officials were ready and waiting with open arms. A year after the tornado, the district still faces a long road before it reaches a full recovery. For now, resources are devoted to the construction of the new elementary school, which will provide extra elbow room for future growth needs. The new structure is expected to include some characteristics of the old, paying homage to the original. Construction is expected to continue throughout the remainder of the year and into next, weather permitting. "It's an awesome deal, just to put the past 11 months away and to go from where we were to where we are now," Morrow said last month. "We've been fortunate."